We are proud to announce the June 2 launch of the new custom dude ranch web design for Blacktail Ranch, a premier guest ranch in Montana. Sandra Renner, co-owner of this Montana dude ranch, stopped by our vendor booth at the 2014 Dude Ranch Association convention and chatted with Pat McCauley about redesigning the Blacktail Ranch website. She formally submitted her request for proposal following the convention. Things got busy for the ranch shortly thereafter when their booking season got into full gear, but we circled back around to the website this year. The new Blacktail Ranch website looks its best on all devices due to the responsive dude ranch web design. This working dude ranch, which has welcomed guests for over 40 years, encompasses 8000 acres of prime Big Sky country at the foot of the Continental Divide and is conveniently located between Yellowstone & Glacier National Parks and Great Falls & Helena, Montana. An unforgettable setting is just the beginning of your Montana dude ranch adventure at Blacktail Ranch. The all-inclusive getaways at Blacktail Ranch offer opportunities for world class horseback riding & fishing, an on-site cave tour, a museum of ranch & prehistoric artifacts, white water rafting, bird watching and horseback camping. They even have a massage service and yoga classes. A wide variety of lodging, from the original lodge, to comfortable cabins and rustic wall tents, is available at the ranch. Owners John “Tag” Rittel and Sandra and the ranch staff provide hospitality and personalized attention to their guests. AFTER: The new Blacktail Ranch logo is emblematic of the many upgrades the ranch has made to their facilities, lodging and services in recent years and suits the new website perfectly. Sandra knew that this project was nothing less than a “marketing makeover” for Blacktail Ranch and requested that our graphic design department create a new logo. Jim McCauley, our print and graphic design department manager, worked with Sandra to design a new logo that would symbolize the new marketing message for this Montana guest ranch. The result of this collaboration is more contemporary and stylized, but retains a rustic charm to match both the ranch itself and the website design that was to come. That design had to wait until Blacktail Ranch got through its busy 2014 season, but this first important piece was ready and waiting. BEFORE: The wide open spaces of the previous design grew larger as monitor resolutions increased and web standards changed. The previous website for Blacktail Ranch was launched over five years ago. It had an open, western feel to it, but the coding and design standards were already “behind the times” in many ways and this only worsened as time went on. No “mobile friendly” version of the website was available to users with smartphones and other devices, which meant that the website was in danger of losing mobile search visibility in the wake of the Google Mobile Friendly algorithm update that rolled out on April 21. 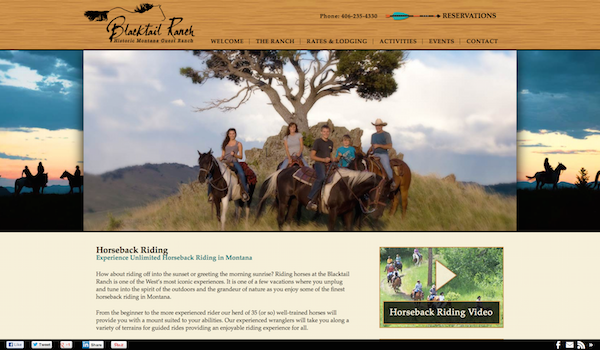 AFTER: There’s still plenty of eye-appealing open space in the new Blacktail Ranch web design, but it adapts the layout and content to fit whatever browser or device is viewing it, from the smallest smartphone screens to the largest monitors. A busy season at the ranch and some “life happens” challenges meant that the new website was on hold until Sandra contacted us in January to resume discussing her needs. By mid-February she was ready to commit to the new design. 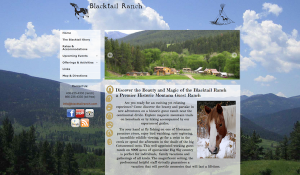 The new Blacktail Ranch web design began with Beth, our lead web designer, contacting Sandra with a detailed questionnaire to gather the information and materials to create a brand new “look and feel” for the website. This extensive questionnaire assisted Sandra in making decisions 0n the most important basic elements of the new website’s design and gave her a list of needed materials to provide so that Beth could take her concept and make a layout proof. 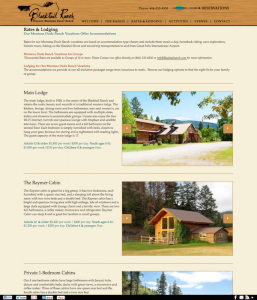 Creation and management of listings for the ranch’s lodging options was made easier thanks to the Rooms manager custom post type developed by InsideOut Solutions. Sandra recognized that their website text also needed extensive rewriting. Beth worked with her to make sure the text content of the new website’s pages took full advantage of the responsive WordPress design. Before launch, Search Engine Optimization (SEO) services were applied to each page of the website’s code and content and scored by the Yoast WordPress SEO plugin. Redirects for previous URLs were set up in order to eliminate any “page not found” errors once the new site went online. Following the launch, additional SEO was applied to the website by optimizing the settings of their Google Analytics account and creating a Google Webmaster Tools account to submit both the new website and the new sitemap so that everything would be quickly indexed. Free training in WordPress was included so that Sandra could quickly learn how to use their website to grow their internet marketing effectiveness. Our WordPress install also includes WordPress video manuals, an e-book user manual, and our monthly Blogging for Beginners Webinar is available to all our WordPress website clients as well. Dude ranch websites developed by InsideOut Solutions that are over four years old will generally require a full responsive redesign. 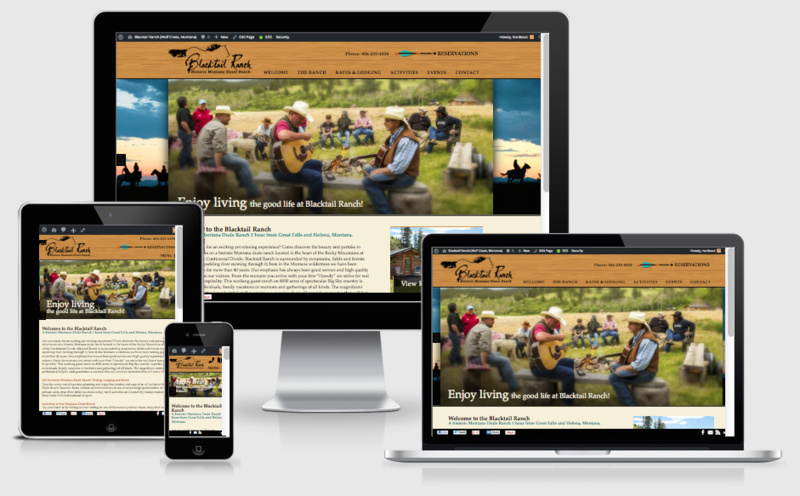 If you have a dude ranch web design we created that’s four or less years old we can provide you with a cost-saving responsive upgrade. Don’t have a WordPress website? We’ll build you one with a responsive dude ranch web design. Contact us today for a quote to keep your dude ranch’s website ahead of the competition.